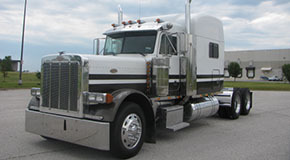 QTS2092 - 2007 COLUMBIA DAYCAB - $36,500 - CLEAN! COME CHECK US OUT AT OUR NEW LOCATION FOR A NEW TRUCK OR WORK ON YOUR CURRENT RIG!!! 101 SOUTH CARTAGE LANE STRAFFORD MO. 65757. QTS1950A- NEW PAINT, FULL SKIRTING, SINGLE EXHAUST BEHIND THE SLEEPER, 10 LIKE NEW VIRGIN TIRES, NICE CABINETS IN THE SLEEPER, NEW U-JOINTS, KINPINS AND STEER BRAKES, STRONG DYNO WITH 425 HP TO THE GROUND. CUMMINS ISX WITH A 10 SPEED. CALL 888-769-1999. 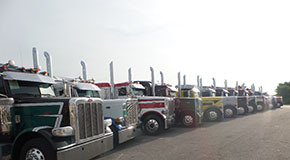 Quality Truck Sales was started in 2008 with the vision of delivering reliable used truck to truckers across the country. Since our beginning, we have sold over 5,000 trucks to customers in all aspects of the business in all parts of the country. 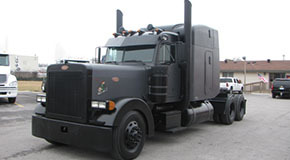 Our team is comprised of owner Todd Clark, who has been in the trucking industry for the last 16 years, first financing purchases for fleets and owner operators and since 2008 as manager of QTS. James Barrett, Chris Smith and Arsenio Rodriguez are also here to take care of your trucking needs. All three are long time participants in the trucking industry and will work tirelessly to answer your questions and put you in the right truck to get the job done! Because of this experience, you are working with professionals who understand your needs when buying, operating and financing a truck for your business. We pride ourselves on our ability to work with our customers and meet your expectations. Give us a call and see what we have to offer.